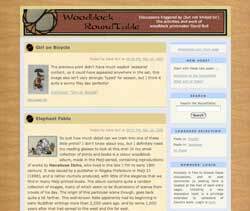 The entry point for the collection of websites belonging to woodblock printmaker David Bull. This year's Gift Print is now available! We do live Twitch broadcasts most days! Our new shop in Asakusa is open! Come and visit for a Print Party! An NHK TV broadcast covering some of my work (in English) can be viewed here. This front page for the site gives immediate access to all the content - an overview of my work, images of all the prints I have made, stories about them, on-line copies of my newsletter, and many many other things to see and read. Here is the page of information on the book, as well as a link to a free sample download of more than 1/3 of the book content, so that you can see for yourself! After many years of working completely alone - doing all the carving and printing by myself - I decided to 'open up' and establish a 'real' workshop some years ago. It has now grown to encompass nearly two dozen people, working as carvers, printers, sho assistants, and a group of support staff (packing, shipping, etc.) We have a shop in the Asakusa district of Tokyo, and also have a full online catalogue of prints. The summer of 2012 saw an astonishing upheaval in life here at woodblock.com After nearly a quarter century of focussing my work almost exclusively on reproduction of classical designs (with a small amount of my own original work thrown in), I have now become involved in a very large scale project working with a contemporary artist - the American illustrator Jed Henry. We ran an astonishingly successful Kickstarter campaign together, and the various print series that have been growing out of that are now featured here. Please take a look at our work on the Ukiyoe Heroes, and its 'sub' series, the Chibi Heroes, Ukiyoe Heroes Portraits, and The Henry Manga. I'm sure you won't be disappointed! After a very successful run for the previous Mystique series, I can say completely honestly that this next print project - which will be the third in the Treasure Chest series - is truly 'by popular demand', as many of the collectors wrote and asked me to do another one. The theme this time is both simple, and yet very deep. I will be exploring 'The Arts of Japan'. Hollywood can do it, so why can't we? The previous Hanga Treasure Chest was very successful, and appreciated by the collectors, so it's time for a sequel! The Mystique of the Japanese Print is a set of 18 beautiful prints, which will bring to the collectors a good overview of just what it is that makes traditional Japanese prints so beautiful. In a radical departure from the previous two decades of making reproductions of traditional Japanese prints, this project featured designs of my own creation. My Solitudes was a three-year project (summer '07 ~ spring '10), which consisted of a set of 12 woodblock prints, each paired with a chapter of a book, together illustrating and describing three of my 'private' nature retreats through the course of a year. Now that the series is complete, the 12 prints/books are available either as a complete set all at once, or as a monthly 'subscription' over the course of a year. After the long year of work making 24 prints in the Treasure Chest, I flipped right the other way for 2006 - I produced just one print, making a reproduction of an early Edo-era painting, in scroll form. I also documented the process as I went along, and you can read about it on these pages. As a result of prodding from collectors to do another series of small prints that incorporates a display stand, I introduced the Small Print Collection in 2006. There are ten prints in this set, making it my most affordable print series ever! The prints can all be seen on the pages here. Introducing my Treasure Chest - a set of 24 postcard-size prints, packed together with a storage box that doubles as a beautiful display stand. For yourself, or for a friend, it is a dynamite gift idea ... a beautiful new print arrives in your mailbox every two weeks! Read all about it on these pages. This section of the website showcases my series of four prints based on the bijin (beautiful women) theme. This website displays the delicate and beautiful 'surimono' prints that I made in the five years following the end of my ten-year long 'Hyakunin Isshu' print series. Of particular interest may be the detailed series of photographs showing each step in the production of one of the prints. Get to the site through its main index page. This website contains the complete set of images of my reproduction set of Katsukawa Shunsho's designs for the famous 'One Hundred Poems from One Hundred Poets'. Making the complete set took me ten years - from 1989 through 1998. It won't take you that long to browse the prints and stories! Using blogging tools, I have created the RoundTable as a place where my collectors (and fans) can offer their comments and discussion on my work. Perusing media material is an excellent way to get familiar with my work, so I have scanned/ripped/typed a number of items - TV programs, newspaper clippings, and radio interviews - and included them here in my 'Woodblock Shimbun'. You will find a 'Table of Contents' over on the Index Page. Please take a look at some of the material; I think you might enjoy it! This collection of stories had its genesis in pieces I submitted to various weekly papers in Tokyo. Although these newspapers and magazines are aimed at Japanese people who wish to improve their English reading and comprehension skills, it seems that my writing style - straightforward and familiar - is enjoyable for native speakers too. So a couple of years ago I decided to publish a series of stories on my own, on a special web site devoted to them. English printmaker John Platt died in 1967, leaving behind a collection of 40 woodblock prints.